Adolt, R., Maděra, P., Abraham J., Čupa, P., Svátek, M., Matula, R., Šebesta, J., Čermák, M., Volařík, D., Koutecký, T., Rejžek, M., Šenfeldr, M., Veska, J., Habrová, H., Čermák, Z., Němec, P. (2014): Field Survey of Dracaena Cinnabari Populations in Firmihin, Socotra Island: Methodology and Preliminary Results. Journal of Landscape Ecology. Volume 6, Issue 3, Pages 7–34, ISSN (Online) 1805-4196, DOI: 10.2478/jlecol-2014-0001, August 2014. Lvončík, S., Maděra, P., Volařík, D., Vrškový, B., Habrová, H. (2014): First Proposal Of Seed Regions For Frankincense Trees (Boswellia Spp.) On Socotra Island. Journal of Landscape Ecology. Volume 6, Issue 3, Pages 35–45, ISSN (Online) 1805-4196, DOI: 10.2478/jlecol-2014-0002, August 2014. Maděra, P., Kovář, P., Vojta, J., Volařík, D., Úradníček, L., Salašová, A., Koblížek, J., Jelínek, P. (2014): Vegetation Succession Along New Roads at Soqotra Island (Yemen): Effects of Invasive Plant Species and Utilization of Selected Native Plant Resistence Against Disturbance. Journal of Landscape Ecology. Volume 6, Issue 3, Pages 46–59, ISSN (Online) 1805-4196, DOI: 10.2478/jlecol-2014-0003, August 2014. Habrová, H., Buček, A. (2014): Overview of Biotope Types of Socotra Island. Journal of Landscape Ecology. Volume 6, Issue 3, Pages 60–83, ISSN (Online) 1805-4196, DOI: 10.2478/jlecol-2014-0004, August 2014. Adolt, R., Habrová, H., Maděra, P. (2012): Crown age estimation of a monocotyledonous tree species Dracaena cinnabari using logistic regression. Trees – Structure and Function. sv. 26, č. 4, s. 1287-1298. ISSN 0931-1890. Habrová, H., Buček, A. (2010): Vegetation and Geobiocoenological Typology of the Soqotra Island. In Tropentag 2010. World food system – A contribution from Europe. 1. vyd. Göttingen: Cuvillier Verlag, 2010, s. 206. ISBN 978-3-86955-455-6. Habrová, H., Čermák, Z., Pavliš, J. (2009): Dragon’s blood tree – threatened by overmaturity, not by extinction: Dynamics of a Dracaena cinnabari woodland in the mountains of Soqotra. Biological Conservation. 2009. sv. 142, č. 4, s. 772-778. Habrova, H., Kral, K., Madera, P. (2007): The Weather Pattern in one of the Oldest Forest Ecosystems on Earth – Dragon’s Blood Tree Forest (Dracaena cinnabari) on Firmihin – Soqotra Island. In Roznovsky J., Litschmann T., Vyskot I., Forest Climate, Conference Proceedings, p. 13. ISBN 978-80-86690-40-7. Culek, M., Kral, K., Habrova, H., Madera, P., Pavlis, J., Adolt, R. (2006): Socotra’s Annual Weather Pattern. In: Cheung, C., DeVantier, L., Van Damme, K.: Socotra – a Natural History of the Islands and Their People. Odyssey Books and Guides, AirPhoto Int. Ltd, Hong Kong. pp. 42-45. Kral, K., Pavlis, J. 2006. The first detailed land cover map of Socotra Island by Landsat /ETM+ data. Int. J. Remote Sens. 27(15), 3239-3250. Adolt, R., Pavlis, J. 2004. 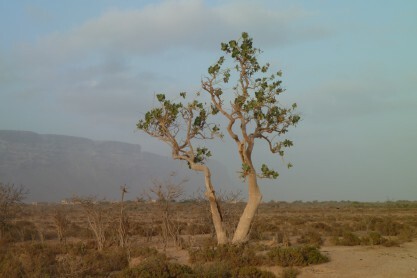 Age structure and growth of Dracaena cinnabari populations on Socotra. Trees Structure and Function 18(1), 43-53. Habrova, H. 2004. Geobiocoenological Differentiation as a Tool for Sustainable Land-use of Socotra Island. Ekologia Bratislava. 23, 47-57. Buček, A., Pavliš, J., Habrová, H. (2003): Geobiocoenological Typology and Agroforestry as a Tool for Sustainable Development of Soqotra Island. Sborník referátů z druhého mezinárodního sympozia 14.-16.12.2003 “The Developing Strategy of Socotra Archipelago and Other Yemeni Islands” v Adenu. Volume II, str. 97-108. National Library Aden, No 61/2003.